Home / Our Stories / Now What Do I Do About These Spring Allergies? When spring rolls around, it brings singing birds, blooming flowers, budding trees ... and sneezing, runny noses and watery eyes. An estimated 25 million Americans suffer from spring allergies or hay fever, making it a season of discomfort for many. What triggers these symptoms? There are usually three pollen seasons: spring, summer and fall. With trees generally pollinating in the spring, Missouri’s biggest allergy triggers are oak, cedar, hickory, walnut and ash trees. 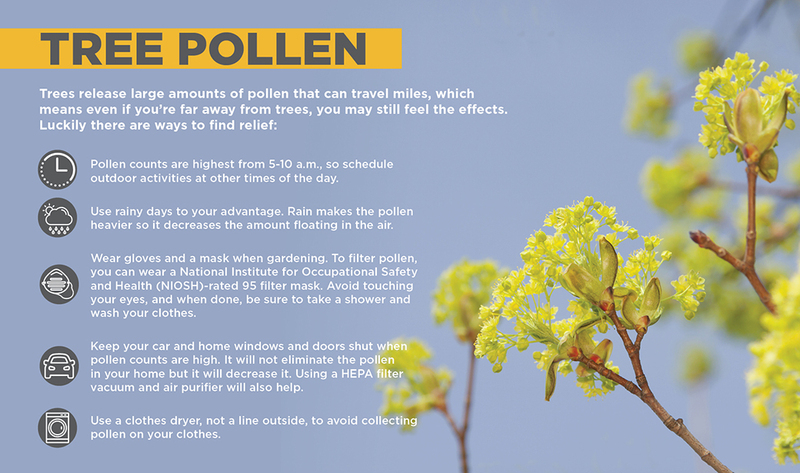 Because of Missouri’s frequent weather changes, pollen levels may start rising as early as January or as late as March. Taking a daily nasal corticosteroid and antihistamine should help to decrease any allergy symptoms this spring. If you have eye symptoms, over-the-counter allergy eye drops can be helpful. At MU Health Care’s ENT and Allergy Center of Missouri, we offer immunotherapy allergy treatments, including shots, drops that go under your tongue, tablets that dissolve in your mouth and toothpaste. Daily or weekly treatments are available. They typically continue for three to five years. Recent studies indicate allergies may be underdiagnosed and undertreated, especially for school-age children. Allergy symptoms are often mistaken for the common cold. If you or your children are having symptoms that last longer than seven to 10 days, you might benefit from allergy treatment. Please call the ENT and Allergy Center of Missouri at 573-817-3000 to schedule a consultation with one of our providers. If you fill your medications with MU Health Care, we offer a convenient online system to refill your allergy medications.